Are you interested in more carols? 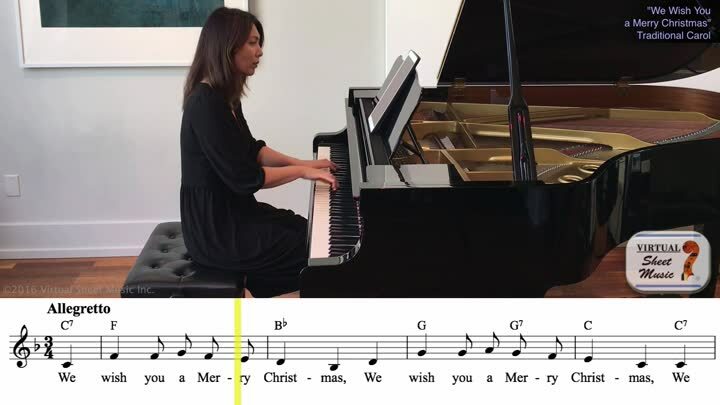 About "We Wish You a Merry Christmas"
Enjoy playing the famous Christmas carol "We Wish You a Merry Christmas" accompanied by concert pianist, Lisa Maresch. Thanks to our unique interactive video player, you can easily speed up and slow down the tempo of the piano accompaniment audio/video track, set up loops and markings - all while reading your violin part from the same video. A useful tool for any musician. The video shows the melody with lyrics and chord indications synchronized with the piano accompaniment. This accompaiment is based on the special arrangement by Fabrizio Ferrari taken from the top seller Christmas Sheet Music Collection for piano, voice or other instruments. Exclusive piano accompaniment video by Lisa Maresch.